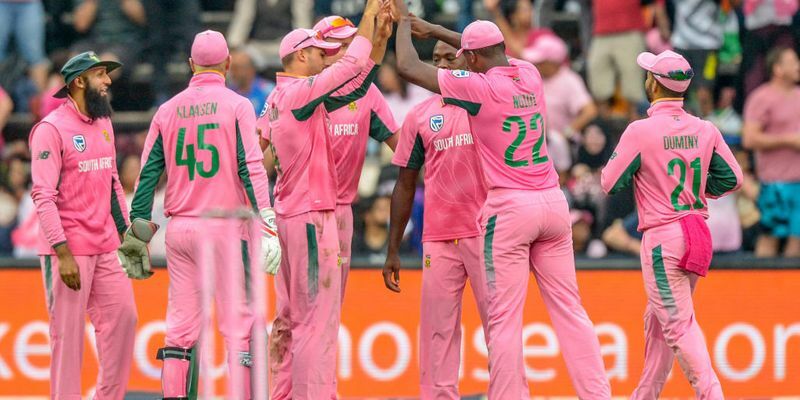 After getting two lives in two consecutive overs, David Miller made India pay for their mistakes and with a swashbuckling 39-run innings, gave SA a five-wicket victory. India posted 292 thanks to a Shikhar Dhawan century, but rain interruption resulted in SA be given a 202-run target in 28 overs. Brief scores: India 289/7 (Shikhar Dhawan 109, Virat Kohli 75, MS Dhoni 42*; Lungi Ngidi 2-52) lost to South Africa 207/5 (Heinrich Klaasen 43*, David Miller 39; Kuldeep Yadav 2/51, Jasprit Bumrah 1/21) by five wickets. India won the toss and opted to bat first as they came into the Johannesburg ODI with a more adventurous middle order with Shreyas Iyer coming in for Kedar Jadhav. South Africa came into the game with the huge boost of AB de Villiers returning to the squad, who replaced Khaya Zondo in the starting eleven, and Morne Morkel coming to replace Imran Tahir. Rohit Sharma hasn’t been anywhere near his true self in the ODI series so far. Shikhar Dhawan had stated ahead of the last third ODI that his opening partner was just one innings short from getting back his form, and it seems that Rohit will have to wait longer to get into his zone. His only positive has been his timing, which he showed from a delicate boundary from Kagiso Rabada’s delivery in the second over itself. However, that was pretty much it as he was caught and bowled by the same bowler two overs later as he returned to the dugout adding just five runs to the total. Skipper Virat Kohli came in next with India reduced to 20/1 and started the inevitable partnership with Dhawan, which had been blossoming for the past three ODIs. Dhawan got his 26th ODI fifty in the 19th over as the duo brought up India’s 100-run stand, while Kohli got his in the 22nd over. The duo kept rotating strikes with occasional boundaries in quite an easy manner as India approached their 150-run mark in the 25th over. The narrative finally diverted from a familiar script when Kohli was seen returning to the pavillion in the 32nd over as Chris Morris ended the 158-run partnership. Kohli remained 25 run short of his 35th ton as he left a not-so-good middle order in a promising position of 178/2. Dhawan brought up his 13th ODI ton two overs later entering a rare club of individuals in the process who have scored a century in their 100th ODI. However, just as the pair of Dhawan and Ajinkya Rahane was looking dangerous, the Proteas got rid of the well-settled southpaw in the 35th over. The flurry of dismissals continued as Rahane returned six balls later, reducing India to 210/4 in the 37th over. The decision to bat first suddenly looked poor as India were on the back foot for the first time in the ODI series. MS Dhoni came amidst the turmoil and forged a crucial 37-run partnership with an inexperienced Shreyas Iyer on the other end. After Iyer left in the 44th over leaving India at 247/5, both Hardik Pandya and Bhuvneshwar Kumar failed to make any impact whatsoever as India ended innings on 289/7, thanks to Dhoni’s late heroics. With the target hardly looking difficult, South Africa started on a confident note with skipper Aiden Markram and Hashim Amla negotiating with Jasprit Bumrah and Bhuvneshwar. However, the skipper eventually fell in the eighth over as Bumrah caught him plumb on the front foot, following which the game was paused for over two hours due to rain. Once the game restarted, it was the same old story as Duminy was caught plumb in front of his stumps by Kuldeep Yadav. The incoming AB de Villiers relieved some of the pressure with a much-needed boundary in the 14th over, but he was standing at the non-striker’s end when Amla was sent packing by a brilliant catch by Bhuvneshwar off Kuldeep’s bowling. Just as the momentum seemed to be swinging in India’s direction, de Villiers took 17 runs off a Chahal over to put the pressure back on the visitors. However, with de Villiers being caught at fine leg and 99 required off 11 overs, the game had seen another swing of momentum. But the twists weren’t done yet as Miller was sent packing by Chahal only to be given a lifeline after the Indian had overstepped his line. Miller made the visitors pay as he led the way for his side scoring 37 runs off the next three overs to bring the equation to a 57 required off 42 balls. With 15 runs coming off the next over, the hosts were well and truly in the driving seat and Kohli decided to bring in his death over specialist, Jasprit Bumrah, in the hope of getting a breakthrough. Even though that didn’t yield a wicket, Chahal in the next over got rid of the dangerous Miller but the equation had reduced to almost a run a ball. With Klassen and Phehlukwayo taking 17 runs of Kuldeep’s last over, the match was virtually done with South Africa needing just nine to win off the last three overs.